Report contributed by Mukta Chakravorty. Good news for all seafood lovers in Bangalore! BBQ Nation is hosting a one-of-a-kind seafood festival – Treasures of the Sea – in all its outlets till February 8. On Thursday night, armed with a voracious appetite, we went to check out the fare on a special invitation. The first thing we noticed on entering the Indiranagar outlet of BBQ Nation, was that the ambience reflected the theme of the festival. So the staff were dressed in pirate hats, there were finishing nets on the ceiling, a wall that had a picture of Ariel, the mermaid. It put us in the mood to savour some of the delightful treats to come ahead. As we took our seats, we were greeted by Ritam Mukherjee, Regional Manager of the South for BBQ Nation who said that the festival was being organized for the fifth time in a row. The aim was to give seafood lovers a chance to indulge in some of the tastiest and freshest catch from the seas. The chef had ensured that the spread included a wide range of signature dishes from different parts of the world including Goa, Mangalore and even Jamaica! Of course the vegetarians need not be disappointed as there was more than enough variety to tickle their taste buds as well. He wished us ‘bon appetit’, and without further ado, we got down to the main business of the evening – tucking in to the food! 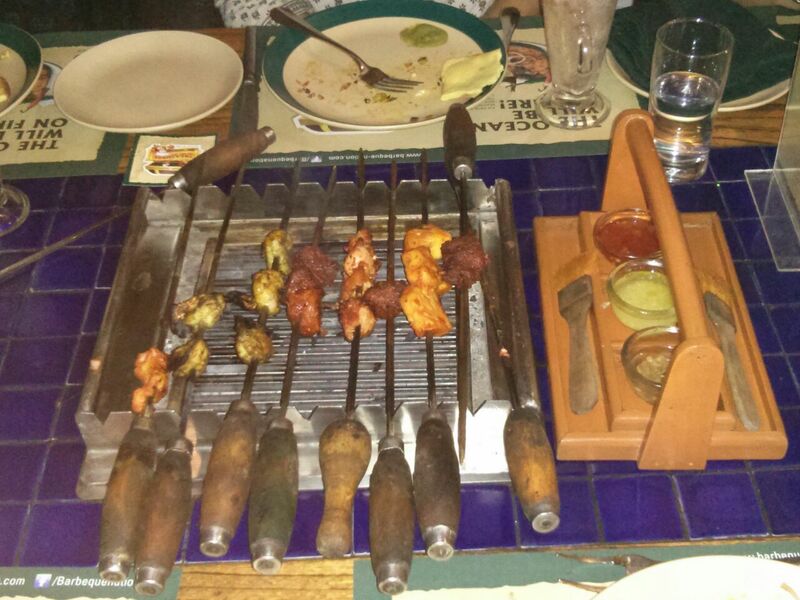 BBQ Nation is known for its all you can eat starters, and we weren’t disappointed at all! We started with the crispy fried anchovies with mint sauce and moved on to the crumb fried squids which went well with the aioli dip. The basa in peri-peri sauce was delicious, the fish was quite fresh. The other non-veg starters included mutton gehlawati kabab, Maryland crab cakes, mai tai prawns and Jamaican jerk chicken. The crab cakes were crisp on the outside and superbly moist on the inside. The vegetarian starters were quite interesting as well. There was a lychee surprise which turned out to be a stellar dish – the sweet juicy flesh of the litchis going well with a slightly spicy filling. There was a rajma and anjeer tikki and paneer tikka and a host of other veg starters as well. After having multiple rounds of the starters, it was with some trepidation that we went for the main course since we were already bursting at the seams. Here too there was a lavish spread which included prawn biryani, meen moily with idiappam, nasi goreng and Mangalorean crab curry, among others. 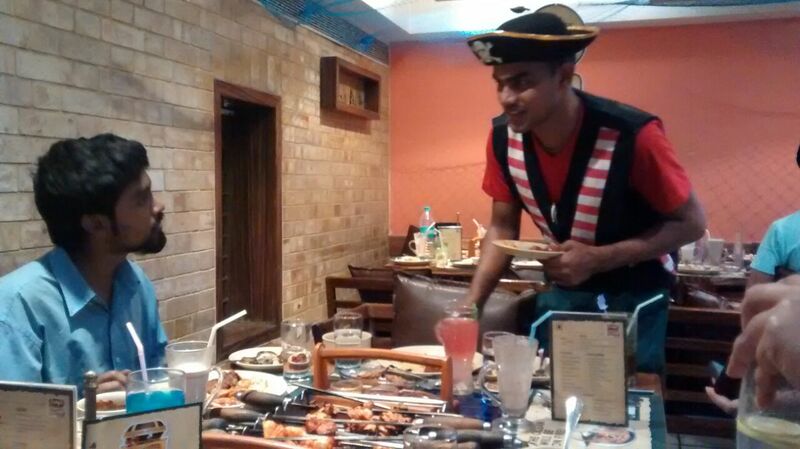 There was also an assorted sea-food platter, prawn cocktail, and chicken and strawberry salad. 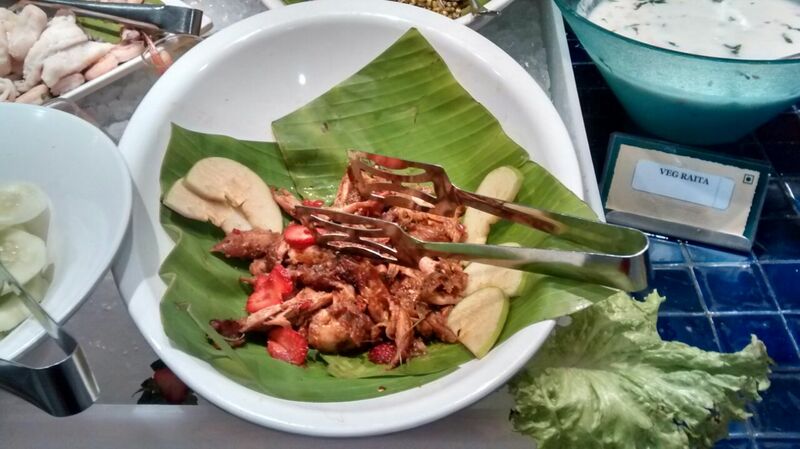 The crabs in the Mangalorean curry were quite succulent. However, it could have done with a just little less salt. For those of you who have a sweet tooth, the dessert counter is definitely worth checking out. I tried the chocolate strawberry tart which was decadent! The tender coconut payasam was delicately flavoured and will be liked by those who don’t like the overpowering taste of sweetness after their meal. The blue sea cheesecake was also something new on the menu. 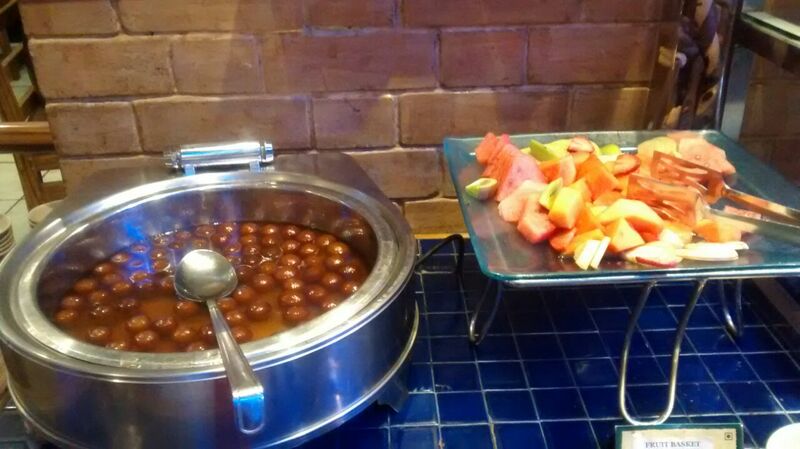 Apart from these, there were the regular sweets like gulab jamuns, phirnee, different flavours of ice-creams, mango mousse and more to satiate your sugar cravings. If you still haven’t had your fill after all this, you can check out the kulfi counter where the guy will dish up different flavours of kulfi for you! Don’t forget to ask for the malai kulfi which I am told is the house speciality.